Discover unique handmade gifts you won’t find elsewhere!! 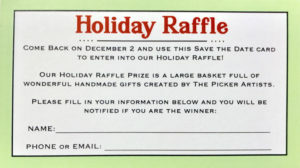 We will have a Raffle Gift Basket of a piece of each of our items on that day. Save this card below, or we will have plenty on that day. Fill out the back of the card with your contact information and drop it in the box in any studio, and you will be entered to win the prize. Please join us for Art Walk 2018 weekend! October 13 & 14, 2018. We are excited once again to be participating in Art Walk. It begins our holiday season here at The Pick, and preparations are well underway for us. Please check back soon and often for details on the events that are happening at our building. We are also happy to announce our Annual Holiday Shopping Day, Saturday, December 1, 2018. 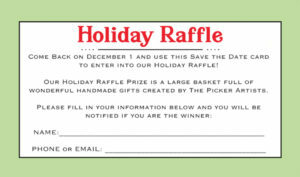 As we did last year, we will be holding a Picker Raffle Basket. 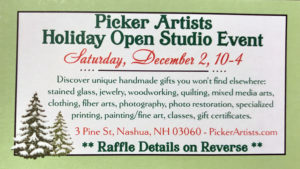 Stop by any of our studios from now till December 1 and pickup a “Save the Date” card, on the reverse are the details of how to enter our raffle to win a Gift Basket, which will contain an item from each of our artists. Or, print it out below. 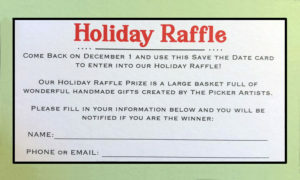 Bring the card with you when you come on December 1 and drop it off in any studio in our building for a chance to win! Pick up Graduation gifts, Mother’s Day gifts, Father’s Day gifts, or put your orders in early for custom work. As always, we are happy to offer specialized services, classes and Gift Certificates too! 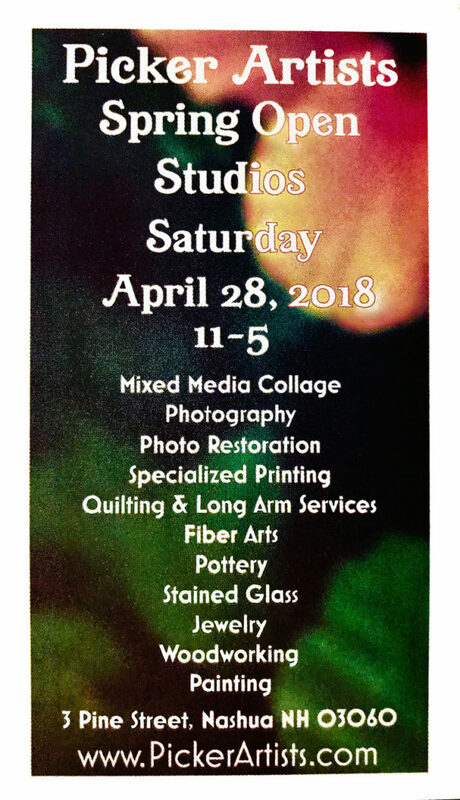 If you are in the area, please stop by and support our local, small businesses creating unique, handmade works of art. I know it seems as if the holidays are far away, but actually they’re much closer than we realize. 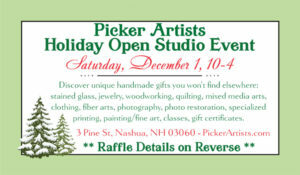 It’s less than a month to our Annual Holiday Open Studio Event! 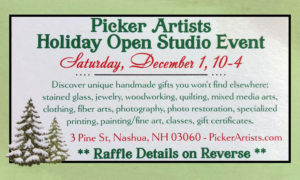 We plan for our Annual Holiday Open Studio Event each year to be the Saturday after the Thanksgiving weekend. So this year, it will be Saturday, December 2 from 10-4. If you are in the area, please stop by and pickup one of our Save the Date cards. Bring it back with you on December 2 and enter to win a gift basket containing an item from each of our studios! Perfect timing for holiday gift giving. 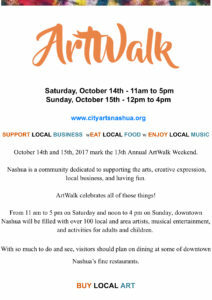 Art Walk Weekend is here! We are so excited to be hosting our first Art Walk with all of us at our new location. Last year’s Art Walk was completely different for us, we were still in the process of building our new location, and the walls were barely up! But this year we are settled, and happy to be hosting this city wide event once again. So, please join us this weekend. We can be found at Stop Number 21 on the map below (lower left corner of the map). 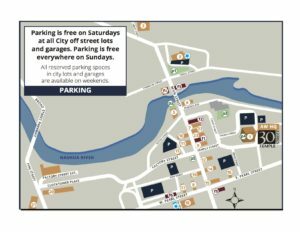 A larger, printable map can be found at CityArtsNashua.org.